Is it just me, or does the most recent release of Carrara seem to be running like SUPER slow? My system is no slouch, and it is pretty strong on resources, but Carrara seems to be having a tough time, even at 64-bit, to the point that it seems almost unworkable at times. Are there any options I can use to optimize this behavior? Other Poser stuff is ok as is from Carrara browser not smart content as is my own stuff and objects. I'm a Noob to Carrara so this might be a given to you. I was having that problem because I didn't realize that Carrara kept all the scenes opened untill I actually closed them. Not like Daz 3d where it closes a file before starting a new one. This is actually a cool feature when you know it does it. What exactly do you mean? Slow doing what? I didn't notice anything like this, but then I didn't have CMS installed most of the time, in case it has anything to do with that. Some more information would really be helpful here. What OS, what's the hardware configuration, etc. There's also some things that can be done to optimize Carrara. Have you changed any of the preferences from the default, especially under imaging and scratch disk? Are you having an issue with a particular scene, what about a new scene? Sorry, I guess that would have helped a bit. Coming from Modo 601 (and staying with, honestly) I'm used to blazing fast switching, rotation, and screen refreshes. Carrara 8.5 Pro isn't doing that so well for me. I've tried with Genesis (which honestly behaves less than ideal, switching between editing, rotating in the viewport, etc) and V4/M4 (which behave much better.) The UI largely seems laggy, and updating is hiccuping at best. I have not changed any of the default options, I suppose I really should look into that, it might help a bit. I am using a custom built (I built it myself) Windows Vista machine with an i7 Core Extreme 3.2 GHz 8 core processor, an EVGA NVidia Geforce 295 GTX (with 1.7GB video RAM,) 12 GBs Corsair RAM, and a Western Digital Velociraptor 10KRPM HD. I'm fairly confident that power isn't the issue. It's been a few days since I've opened up the program (I have a tough time using something that lags behind commands) so if you want more specifics about the issues, it'll take me some time to document all the problems I seem to be having. My system is somewhat similar to yours, and I did not observe any slowdown or hiccups. You can try this though: Make sure your 'Interactive Renderer Settings' (the up-arrow icon or 6th icon from the right in the document window) is set to Open GL not 'Software'. That will make Carrara display somewhat faster. Also, in the same settings, make sure the 'Lighting Mode' is set to 'Light Map'. You should get a very fast hiccup-free OpenGL display on your system. This is actually one of Carrara's strongest point. In my evaluations Carrara's OpenGL is a notch faster than Cinema4D's and far faster than Lightwave's. Another thing you can try is to undock the 'camera Tools' and the '3D View Tools' and leave them undocked, or dock them elsewhere. I have noticed that sometime Carrara display gets stuck and the only way to unstuck it is to undock and redock these palettes. As dr_bernie suggests, there are some things in the interactive renderer that can help. I don't know how much using the light map will help, but I do know that turning down the texture resolution will help. It defaults to quite a high number. If the scene is still lagging, try turning off transparency in the interactive renderer. Just a quick note about the interactive renderer: Whatever settings you use will have absolutely no effect on the final render. Those settings are made in the Render room. It's slow to me too , specially the CMS. I suggest don't use CMS. it become not responsive suddenly when move to modeler tab and then it becomes not responsive when click on contents on CMS. I think the time that the display start getting slow is when you have the smart content tab open for a long period of time. 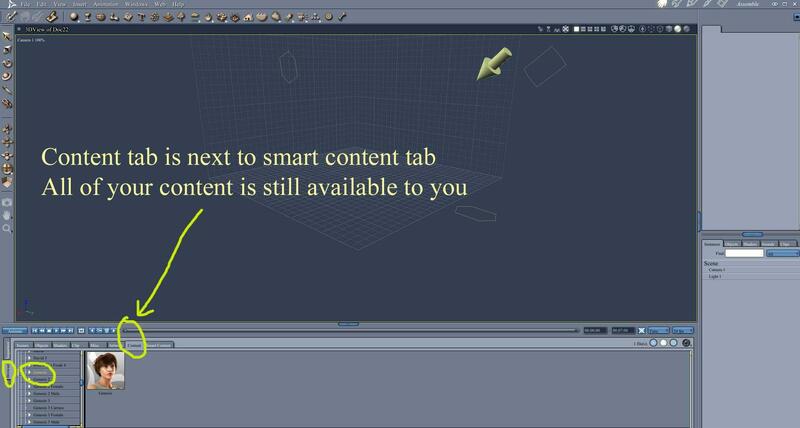 I have Carrara Pro 8.5.1 and would dearly like to teach myself to hand animate using it. I think the UI and color scheme are excellent. However, I have now about 2000 DAZ 3D Store Products plus an assortment of RDNA, Poser, and other products that probably brings that total to 3000 or 4000 products. The problem is Carrara is so slow, that even panning in an newly opened empty medium size scene causes delays of 2, 3, 5 and more minutes before Carrara does what you attempted to tell it to do. I have a more than sufficient PC that handles Blender, Unity, and DAZ Studio fine although it is only a 5 years old 4 core i5 with intergrated GPU laptop. How to configure Carrara such that I can use it? Someone earlier said drop Smart Content? If I do that will that keep the Carrara-Only Content? I can create a Carrara only folder I guess and export from DAZ Studio to Carrara. Hexagon has a Save as a Carrara file.. Some time saving can be had if you use the "Content" tab instead of the "Smart Content" tab. All of your content is available. I have only intergrated GPU so that isn't the problem. I will get rid of the Smart Content tab and use only the Content Tab. The Smart Content Tab seems to be in an active refresh cycle or something all the time judging for how sluggish Carrara is doing anything. 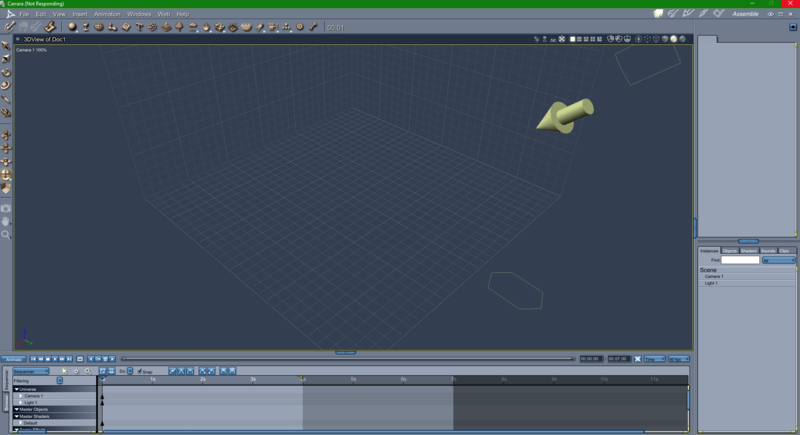 It is the viewport gold pan & move controls near the bottom left edge that it becomes so slow when I click those. It is very bizarre that I can load a DAZ Scene file quicker than I can pan 1 Carrara unit in the viewport up, down, left or right! What am I doing wrong? I guess if I can't resolve this panning issue I'll start on my Blender book I got from Amazon. Thanks though. find out the graphics chipset and get the latest driver from them and try that. No, my HD is fine for lots of free space but it is an external USB 3.0 HD so somewhat slow although DAZ Studio handles it fine. I have Windows 10 Creator with the latest stable video card drivers and all of DAZ Studio, Blender, and Unity 3D 2017.2 Beta have no graphics problems with my laptop. I also have 16GB RAM. A laptop that can do DirectX 10.1 which is openGL 3.1 is quite powerful and capable even if it is an integrated GPU and since it is shared video RAM the 16GB RAM my laptop has is a big boost too. It seems to be unique to Carrara and more specifically something to do with panning. I even changed the Carrara scratch disk tmp directory to be on my system SSD drive Cararra itself in installed and running from my SSD drive. I also did a Preferences Reset to make sure I didn't configure something bizarrely and that helped not either. I'm a bit disappointed because I bought Misty's blended weight Genesis 3 Johnathan & Janette with the intention of trying at least one good go at making a 1 or 2 animation but it doesn't look like it's gonna fly, too bad because I'm liking how the UI is organized. out of interest if you change the view to just box frame do you get the same problem? I had that issue when Windows 10 migrated to "creator". The only way I found to solve the issue was to download Intel driver management utility (I have an Intel 4000 integrated graphic card) and let it download and install its own idea of latest software. From what I could gather from other forum (Sketchup for instance suffers the same issue), the Microsoft driver has a poor implementation of some OpenGL functions used by Carrara and Sketchup. What's definitely not cool is that Windows regularly put back its own driver and I have to update it again (and reboot) with the Intel utility. OK, I tried that and it's just as slow with wireframe. I did replace the Intel MB chipset drivers & such directly at Intel's driver site last night but have yet to reboot. I did that when running the openGL / DirectX utilty that checks what version you have installed (openGL 3.1 / DirectX 10.1). I'm dubious it it will help but I'll find out soon enough.